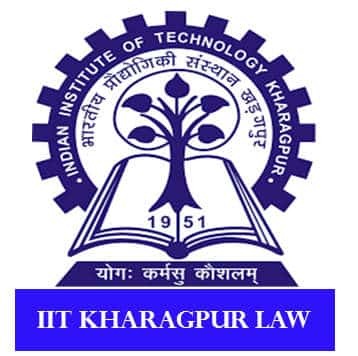 Rajiv Gandhi School of Intellectual Property Law - IIT Kharagpur Law Admission are done on the basis of Computer Based Test conducted by IIT Kharagpur every year. IIT Kharagpur is a renowned technical Institute. Apart from engineering, It also offers a Three-Year Full-Time residential programme leading to the Degree of Bachelor of Laws (Hons) in Intellectual Property Law approved by the Bar Council of India. Online application for Rajiv Gandhi School of Intellectual Property Law - IIT Kharagpur Law Admission has started from 22 January 2018 for IP Law 2018-2021 batch. It is the first renowned law school within IIT Kharagpur that imparts legal education with IP specialization within the IIT System bringing synergy among science, technology, management, and law. As per the guidelines offered by the Bar Council of India, the curriculum of the program is offered within which many specialized courses related to Law and Intellectual Property Rights are offered. Students after Class 12 directly cannot apply. They should have graduated from either of the fields as mentioned in the Eligibility Criteria. Students who are appearing in the final year exams in May/ June 2018 are also eligible for the LLB Hons at IIT Kharagpur. Please note that the candidates need not send the application by post. The application will be considered on the basis of the final online submission of application form. The candidates can submit the IIT Kharagpur Law 2018 application form through online mode on the official website of IIT Kharagpur. The candidate can also check submission, shortlisting, selection and other application related status from Application Status menu. They should remember their login id and password for the same. The candidates who will successfully submit the IIT Kharagpur Law 2018 application form online, will be able to download the admit card on the official website of IIT Kharagpur. The direct link to the admit card will be available on this page below, candidates can click on the following link to download IIT Kharagpur Law Admit Card. Kindly Note: Women candidates are not required to pay the application fees and the Application Fees can be paid Only through Online Payment Gateway. The Admission will be solely done on the basis of Entrance Test followed by Interview. IIT Kharagpur Law 2018 Result: Candidates will be shortlisted for test & interview and will be informed via e-mail only. GD & Interviews will be conducted in the 3rd week of April 2018 at 10.00 a.m.
At the time of Interview, the candidates are required to carry a photocopy of all certificates from Class 10 to qualifying degree along with recent passport size photograph and all original mark sheets for verification. Candidates belonging to the reserved/physically challenged categories must carry supporting document as proof. Type of Questions: The questions are multiple choice and objective type. Each question has 4 options. Choose the right option. Marking Scheme: 1 Mark for each correct answer and there is no negative marking. Graduates and Interns who pursue LL.B. (Hons) Degree in Intellectual Property Rights from Rajiv Gandhi School of Intellectual Property Law get placed in some of the world's renowned organizations such as Infosys, Wipro, Cognizant, Honeywell, Mindtree, Pepsico, Johnson & Johnson and much more. The candidate can give preference of only 1 exam centre while filling up the application form. Note- The institute reserves the right to cancel or change test centres. The changes, if any, will be notified to candidate well in advance.